This week marks Diwali, the annual Hindu festival of lights. In India and elsewhere, the joyous holiday – a major event that coincides with the new year on some calendars – is often marked by gifts of dried fruit and nuts and the lighting of fireworks, lamps and other lights. 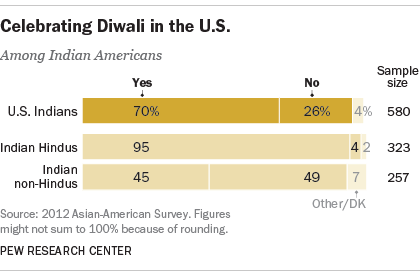 In the U.S., seven-in-ten Indian Americans say they celebrate Diwali, according to a 2012 Pew Research Center survey of Asian Americans. This includes most Indian-American Hindus (95%) and nearly half of those who are not Hindus (45%). That survey found that about half of Indian Americans (51%) identify as Hindus, while 5% identify as Sikhs and 2% as Jains (two other religious groups that also observe Diwali). Most of the rest are Christians (18%), Muslims (10%) or people unaffiliated with any religion (10%). Hinduism has a strong cultural influence in India, where Hindus make up about 80% of the population. 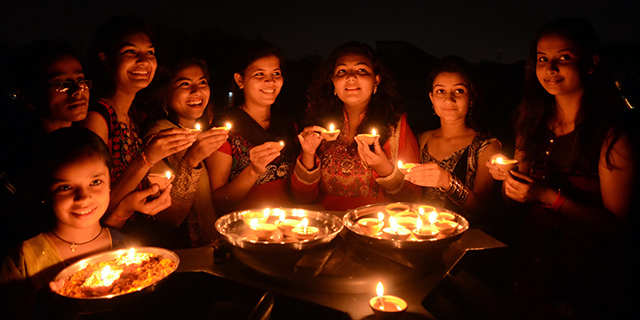 In India, many people who are not Hindus celebrate Diwali, much as many non-Christians in the United States celebrate Christmas.